We both laughed our asses off. 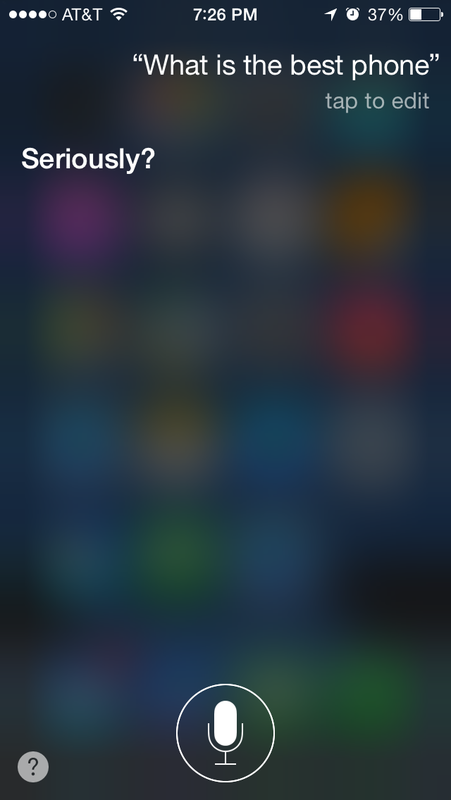 Way to go Apple… that has to be an easter egg. I meant to go online and find more associated with the iPhone, but of course, by the time we got home and completed everything that needed to be done, the thought of my iPhone and easter eggs were long gone. 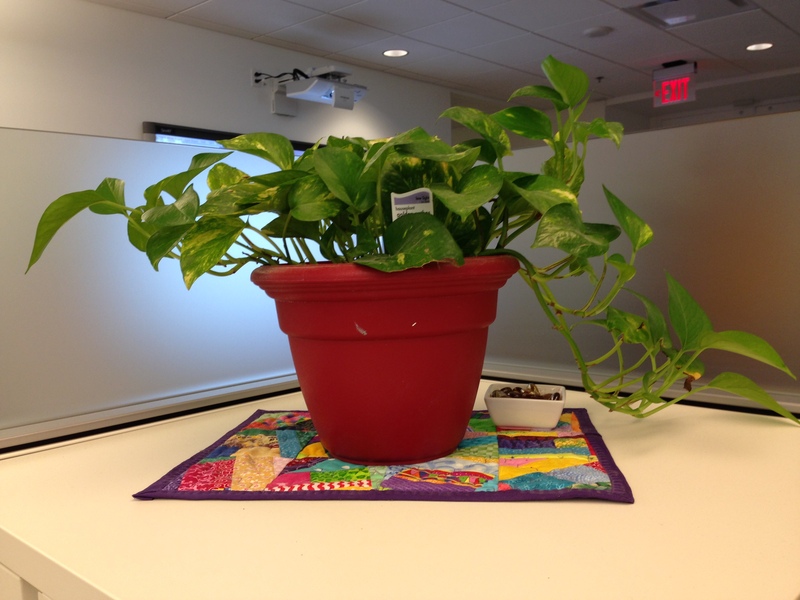 I finally got around to bringing in a plant to my cubicle. It is a relatively young plant and have decided that once a week, I am going to post another photo and track progress. It might be fun to see how much (or how little) it grows from week to week. One more thing… this is what greeted me this morning as I prepared to head to work. 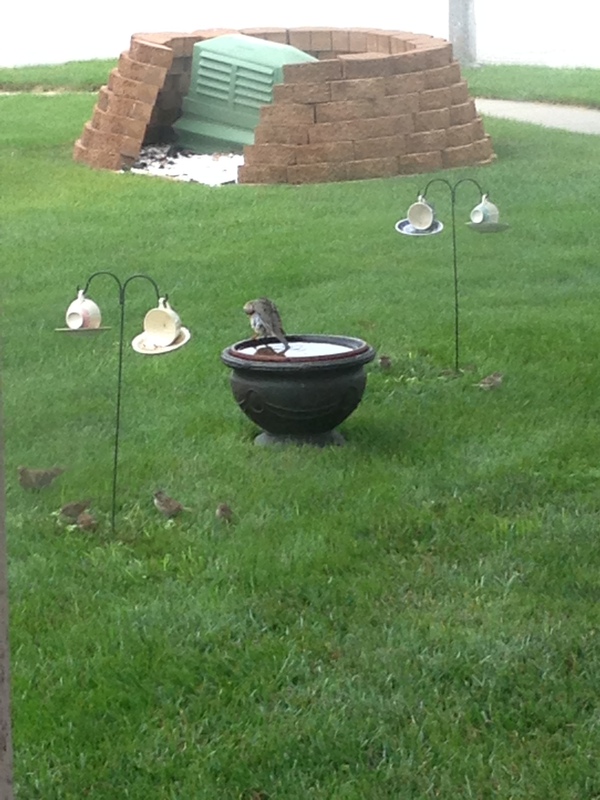 I created a couple of bird feeders from tea cups and their saucers and hung them from short hooks in the front yard. My own little creation for the bird bath as well. And from the looks of things, the birds are enjoying it. If anyone has any kind of idea as to what I can do with that horrible TimeWarner box in the front yard, I’d love to hear it. We stacked the landscaping blocks around it to sort of hide it – although the back was left open as to be accessible to the TW guys. They had to remove part of it once and they never quite got it stacked back up right. I’d love to do something else, or at the very least, I’d like to plant some kind of vine that would cover the bricks. We have the same brick in front of the large picture window for continuity, but the evergreens that we planted pretty much have it camouflaged. Ah, the price of technology. So, if you read my blog, you will know that I am in the second week of a new job. I feel like I am starting to get the hang of things… all the new stuff that comes with a new job and a new company. Like a new language (is it just me or is does it seem like there is an overuse of TLAs*?) and new people and new processes. 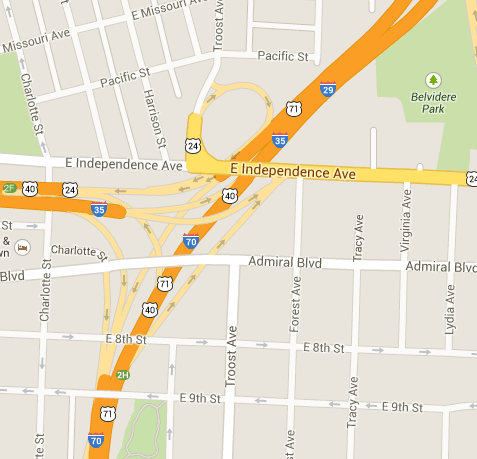 But the one that I find the most perplexing is the commute route. It seems both a navigational and time management issue. 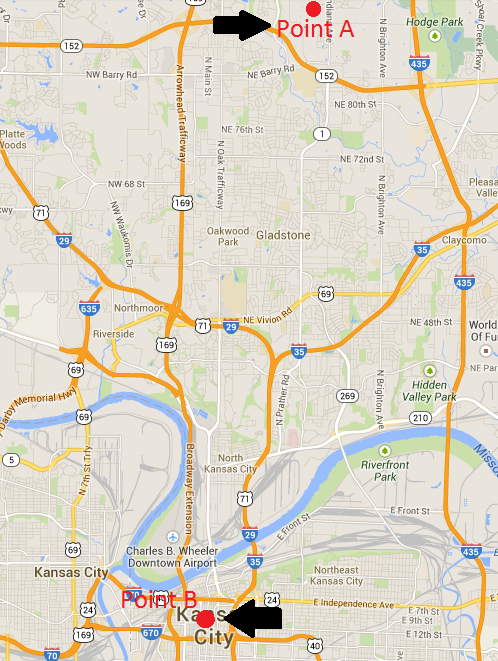 From my home to the office (in downtown Kansas City) I really have two main paths to take: for ease of understanding, I will call them the East and West routes. Both routes are pretty much equal as to the distance, and therein lies the end of the similarities. The West route is, in most respects, the most straightforward in terms of navigation and currently does not have any construction delays. It does, however, have the most change in speed limits, one section goes from 60 to 45 for no apparent reason and the local revenue generators (aka police) tend to hang out in this area. It also has one tricky elbow which suggests a 15 mile per hour limit, which many drivers take too literal. This leads to a traffic backup and the later in the morning you go, the longer the backup. Once through this hazard, however, most traffic veers off to the left for further interstate driving, but I continue south into downtown. Now, the majority of the East route is interstate and capable of much higher sustained speed. I say ‘capable’ because there has rarely been a day that I’ve gone this route to find cars traveling anywhere near the speed limit. I don’t know if it is the addition of 18-wheelers or the confusing last little tangle of several major interstates, highways and exits as you hit ‘downtown’ or just the abundance of commuters, but I have yet to take this path and not come to at least one full stop. This morning’s commute was, to date, the best I have encountered. Considering all of that, though, I didn’t allow myself enough time and was about 8 minutes late walking into the office. I hit the parking ramp straight up 8:00 and by the time I walked to the building and up the elevators, well… I guess I should figure that as part of my commute time. Timing is a funny thing though and found this to be true whether I was making the commute in Phoenix or Los Angeles or San Jose or here in Kansas City. Changing up the time to leave by as little as ten minutes, can add or subtract as much as 30 minutes to a commute. So, its just a matter of trial and error until I find the best route to take. Which is all subjective since the addition of construction, a police car, an accident or weather can throw the whole plan into disarray. Don’t even get me started on winter driving here! Okay, I guess I should get to getting! I started out the new year with the intention of posting daily, even if just a photo. That quickly turned into a few times a week, but lately, it has gone to once a week. And with starting the new job, its now gone to even less than that! Doh! The new job goes well. Other than the change in terminology and a few tools, its a pretty straightforward QA gig. I am already working on my first test plan for Wyoming (we’re state based here) and I think its going to be good. I love my team, especially my manager, who is so laid back and difficult to rattle. Well, at least so far. She has been with this company for like – forever – and she knows everyone and understands the apps we’re working to the nth degree. The rest of the team is awesome and we’re about 50/50 on men versus women. A nice little mix. Because Kathy came up through the ranks, she gets what life is like for the folks down in the trenches. Like later today, we have a 2:00 meeting, but we’re going for ice cream (treated by my manager) first, so how cool is that? We’re using thin clients here at the job, so there are little things that I have to figure out. Since I’ve not used this technology before, it will take a little getting used to, and there are some things that bug the crap out of me. For one, access to our OS is limited, and some things are limited more than others. For example, the client came with all the necessary applications already installed, complete with the shortcuts on the desktop. However, I prefer a clean desktop, but (and here’s where the limitations come in) I can’t delete them! I don’t have that kind of access. Seems a little over-reaching in the big brother department, but who knows, this might be able to be change in the future. Just gotta take some time to figure all this out. So, since I am back at work, I can think about future options. I really, really, really would love to spend a few years in Europe, I just need to find a company that would consider supporting a VISA. It seems a bit of a catch-22, I really need to be in Europe to find a job, but I have to have a job to get to Europe! I am sure that there are ways to do it, I just have to figure them out. So, back to the thin client, I haven’t been able to figure out how to upload pics or graphics to the blog, and I was hoping that this would be primarily a visual blog (and not too much text). So I might have to upload when I get home – I can after all still create and edit posts. 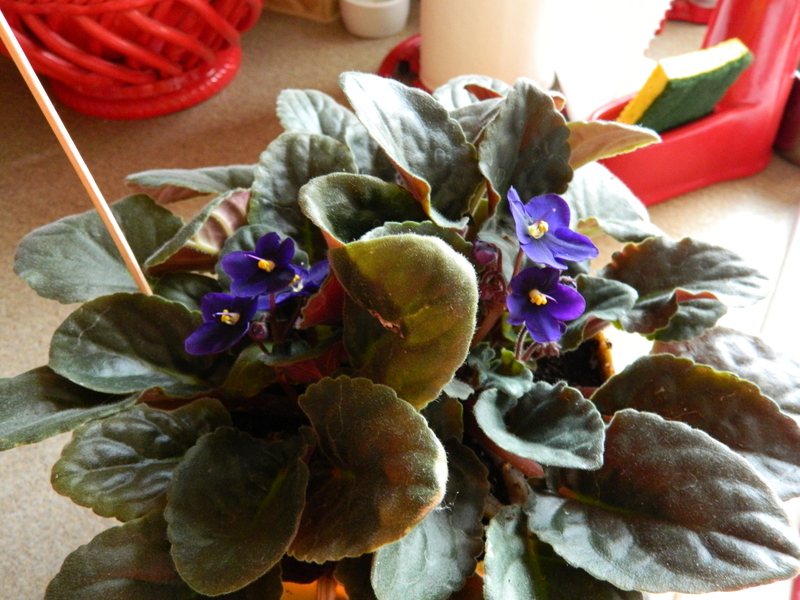 I have another photo of my African Violet. Even more blossoms. I just think it is so cool that this plant has simply exploded as a result of a bigger pot and better soil. Who knew? Why is it so difficult to make this change in my life? I have never been the one to be shy of change, I embrace it! I jokingly call my family gypsies, as we moved a LOT when I was a kid. I think that by the time I started high school, I had been to at least ten different schools. I kind of thought that when I grew up that I would be more inclined to find a spot and plant deep roots, but nope, it seems that I have taken on the same travelin’ spirit that my Dad had. I think I am waiting on something or someone to make this decision for me. It has seemed in the past, that there were always subtle circumstances that, if not downright required a change, at least hinted strongly at one. And whether it be a job (or the chance of a job at a specific company) or the end of a job or relationship, there was always something that got me moving. It was almost like something divine that got me moving. I had blamed the lack of change on waiting for The Kid to finish high school. But that has been almost a year now and I am no further in making any significant change. I had hoped that I would stumble onto the perfect opportunity, something that would send me back across the continent to the west coast, but alas, there has been no sightings on the horizon. I would love to even get the opportunity to go to Europe, but it seems one of those catch-22 situations that I so often find myself. No job to move, but difficult to find a job if I am not already there. And using the word ‘difficult’ seems downright laughable, as what I am talking about is next to impossible. But serendipity might have kicked in this morning, as I realized that I have blown through my unemployment benefits. No extensions. Now I have to get really serious. On a more fun side… The Kid helped his buddy John (whom I refer to as my other son) build a new computer. In return, he brought back the iMac that we had given him a BUNCH of years ago. 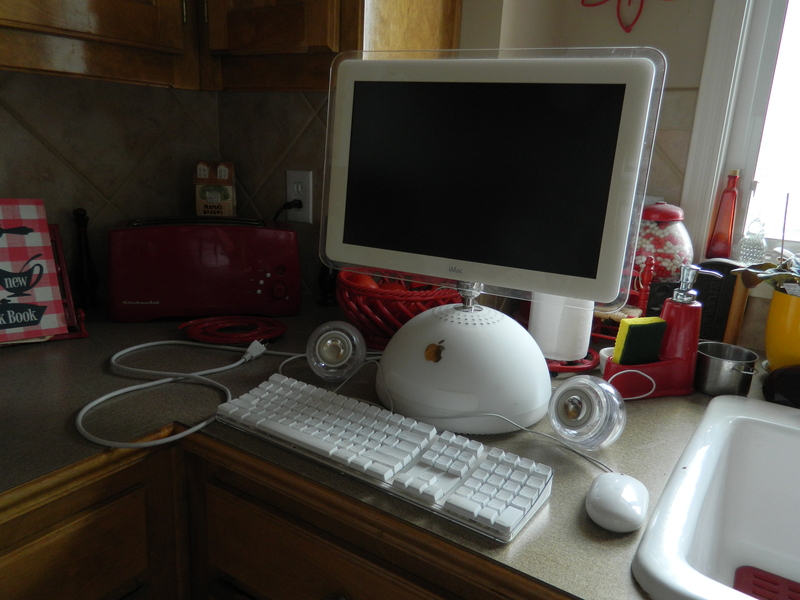 It was iconic in its day and will be given a place of honor in the office (AKA the Mac museum). It is affectionately known as the ‘iLamp’ in this house and I spent many a day in front of it. 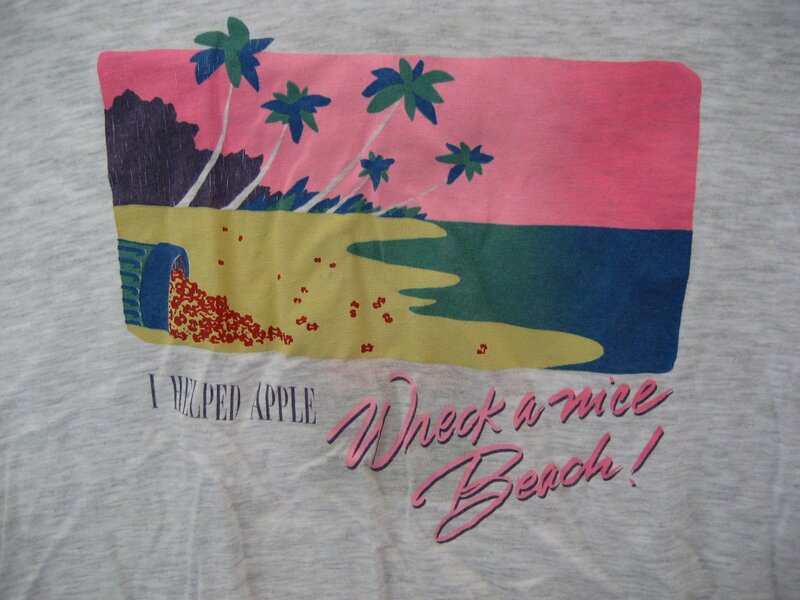 Oh and we turned one more person onto Macintosh computers. He is a lifetime user of Macs now. A few posts back I posted a photo of a surprise violet bloom in my kitchen window. As I was taking the photo of the computer sitting on my kitchen counter, I noticed several more blooms. I am taking this as a positive sign for my future. These purple flowers, along with two job interviews tomorrow, are keeping me going in a positive forward direction. Wish me luck that something good happens!